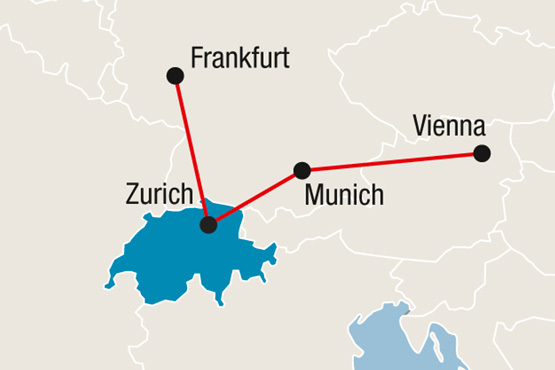 Experience Frankfurt, Zurich, Munich and Vienna, the city with the highest quality of life in the world. 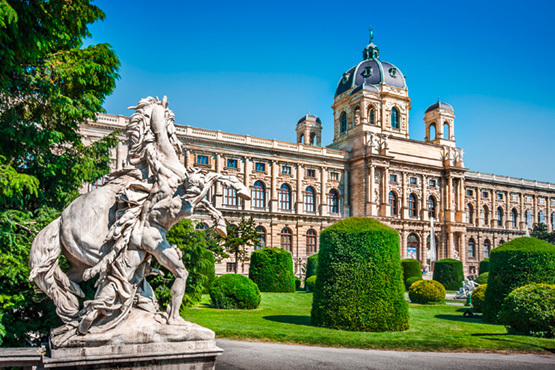 In 9 days you have time to visit such beautiful landscapes as the lovely Rhine Valley on a trip from Frankfurt or the Rhine Falls, Europe's largest waterfall near Zurich. In Munich, a visit to the fairy tale castle Neuschwanstein is recommended as well as the cozy beer gardens, while Austria's capital Vienna attracts with a lot of culture, charm and the highest quality of life in the world. Arrive in Frankfurt by flight and transfer to your hotel. Make a stroll to the «Römer», a restored square. Overnight in Frankfurt. Explore the UNESCO World Heritage Rhine Valley. Excursion details see page 27. Overnight in Frankfurt. Train ride to Zurich. Find out for yourself why Zurich is one of the cities with the highest quality of life. Overnight in Zurich. Use the day to get to know Switzerland better. How about a trip to the Rhine Falls or a day trip to Lucerne? Overnight in Zurich. Train ride to Munich. The city of Munich has a lot of attractions to offer for all ages and tastes. Overnight in Munich. Join a day tour to the famous dream castles Neuschwanstein and Linderhof. Excursion details see page 29. Overnight in Munich. Train ride to Vienna. The cosmopolitan city leads the ranking of the most liveable cities in the world for years. Overnight in Vienna. Castles, museums, hospitality and world-famous coffee house culture await you. Overnight in Vienna. End of your journey. Transfer to the airport of Vienna. Combine your trip to Germany, Switzerland & Austria with any Package in Switzerland, i.e.